Update: I would later successfully summit Mt. Hood on September 8th, 2012. I've been to many places in the Canadian Rockies over the past two years, each of which was beautiful and memorable in its own way. However, occasionally you come across an area that's so special that, even if you walk in with high expectations, the simple reality of being there can overwhelm and take your breath away. King Creek Ridge is one such place. On a day where a lot of things went wrong, the one thing that never faltered (aside from the great weather) was the spectacular views. Regardless of direction, whether towards the sheer grey slabs of the Opal Range, the towering spire of Mt. Wintour, the Kananaskis Lakes with the impressive Mt. Joffre area beyond (and its many 3,000m+ peaks), or the dozens of visible peaks in the Spray Valley Provincial Park, there is always something at which to marvel. The gallery for this trip is nearly double the next largest I've posted to date, simply because it was so difficult to reduce the number of photos I wanted to publish. It may not have been my best day in the mountains, but it was certainly my best day for photography since returning from New Zealand. 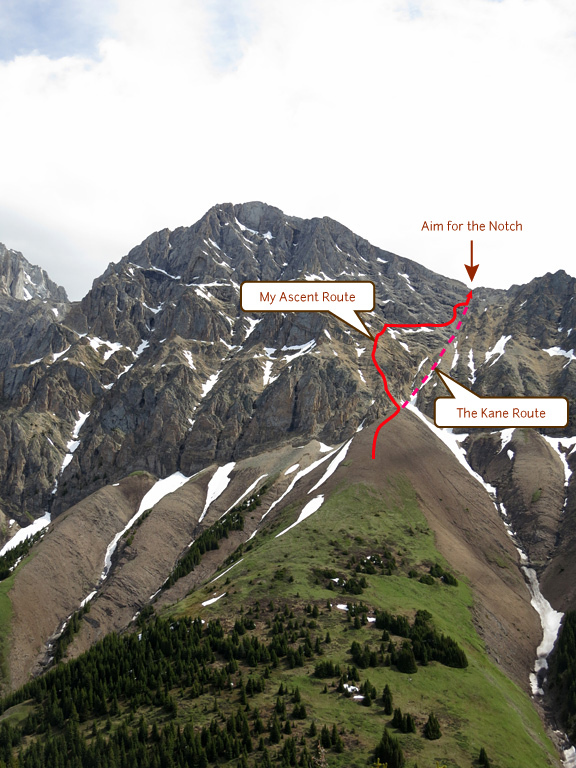 With that out of the way, I'd be remiss not to explain that King Creek Ridge lies at the foot of the Opal Range, a series of sharply upthrust peaks that follow the Kananaskis Trail (Hwy 40) to the south of Kananaskis Village, and to the northwest of the Kananaskis Lakes. 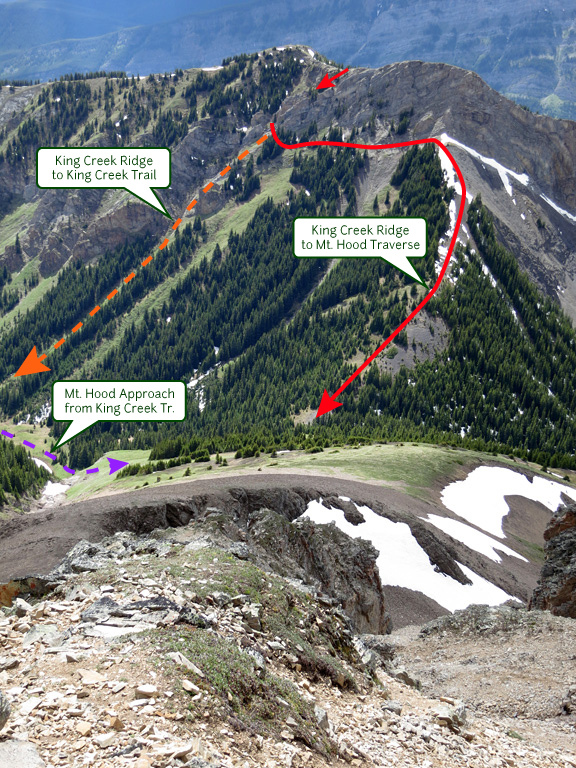 Both the King Creek trail and King Creek Ridge are strictly hikes (that can be linked to form a loop), whereas Mt. Hood (an optional sidetrip) is considered a moderately difficult scramble that should only be attempted by those with experience in such ascents. The day begins at the King Creek Day Use Area, which can be reached by driving 50km south along the Kananaskis Trail (Hwy 40) from the Trans-Canada Highway (Hwy 1). If you pass the seasonal barricade for Peter Lougheed Provincial Park, you've gone too far. My plan for the day was to follow the King Creek trail (the trailhead for which is found directly to the northeast of the parking area) through the canyon to the foot of Mt. Hood, climb Mt. Hood, and then return to the parking area along King Creek Ridge. However, high water levels in the canyon soon forced me to abandon that route and to take the King Creek Ridge route in both directions, which is what I'll describe here. The trail for the ridge starts on the other side of the creek from the day use area; to reach it, walk back towards the road from the parking area and then follow the footpath over a culvert and up the bank on the other side. From there, the trail follows the creek for about 100m before it heads left, up into the forest. If the creek water level is low, you should be able to shortcut directly to the trailhead by hopping over near the picnic area northwest of the parking lot. The best way to describe the trail from the beginning of the forest up to the crest of the ridge is disorganized. It's as though everyone treats it as a wide-open slope even though it's forested; leading to faint and/or parallel trails all over the place. You'll often climb around a tree only to discover that there was a better path around the other side. It doesn't make sense, yet somehow it works. The route finding isn't difficult, since the direction you need to head is obvious (up!) and you won't run into hazardous terrain should you drift slightly, it's just slightly annoying. Scan around every now and then for a cairn or a more defined segment of trail as you ascend, and correct your route accordingly. It was around this point that my GPS unit died. It had gone from 3 out of 4 bars to non-functional in less than an hour and a half. Wonderful (hence why this route was hand drawn in Google Earth). Once you gain the ridge crest, the path becomes very well-defined and a pleasure to walk along as the views increasingly open up in every direction. After a couple kilometres of walking you'll reach the two high points of the ridge, the second of which is the summit at 2,420m (7,940 ft.). 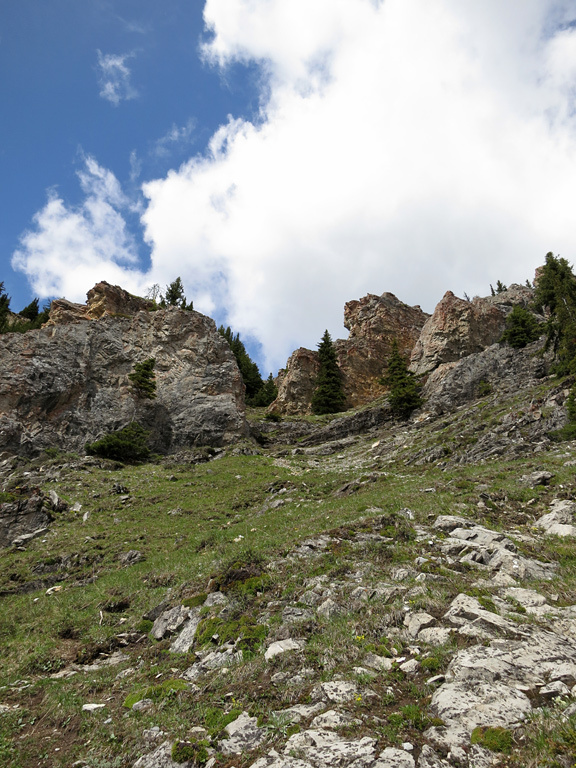 You can either return along the same route, or follow the descending path towards the King Creek trail. You'll find the trail to the east side of the ridge between the two high points. The traverse over to Mt. Hood begins from that same descending path but you will need to contour to the left beneath the cliffs to an alternative trail. The path is easy to miss at the top as it narrowly squeezes between a few trees and the cliffs; look for a cairn in the immediate area of what I've dubbed as “The Gates” (the path would be 20-30m above and to the right from where I took this photo). Unfortunately, the loss of altitude between King Creek Ridge and Mt. Hood is mildly tragic, but the suggested traverse route should save you having to downclimb and then having to regain an additional 70m. Once you've crossed the saddle onto Mt. Hood, it's an easy climb up the grass slopes to the beginning of the scramble. Your goal from this junction is to reach a notch in the connecting ridge between Mt. Hood and Mt. Brock, and there are at least two routes for accomplishing this feat. The traditional “Kane route” that ascends a gully directly towards the notch was not only snow-filled, but also had a loud stream running just beneath the surface, making it a rather undesirable route on this day. Instead, I picked out an alternative route trying to ascend through the best rock I could find on the climber's left for most of the way, before contouring beneath a small cliff band back towards the traditional ascent gully on the right. I eventually joined the traditional route for the last several metres beneath the col. It's from here that you'll get your first views of the Fisher Range and distant peaks such as Mt. Glasgow. Note that there is a ton of loose debris on this slope, and that the rock itself can be of a suspicious quality at times. More than once I had a hold break-off in my hand when I tested it. Rockfall is a very real hazard here, so be sure to have a helmet and, if in a group, make sure not to place yourself in the path of someone else's cascading debris. On most days, your hard work would be done upon reaching the col. All that would be left would be a mildly exposed, 200-300m scree slog past the false summit and then on to the true summit. However, last winter's heavy snowfall had left me a most unpleasant surprise. 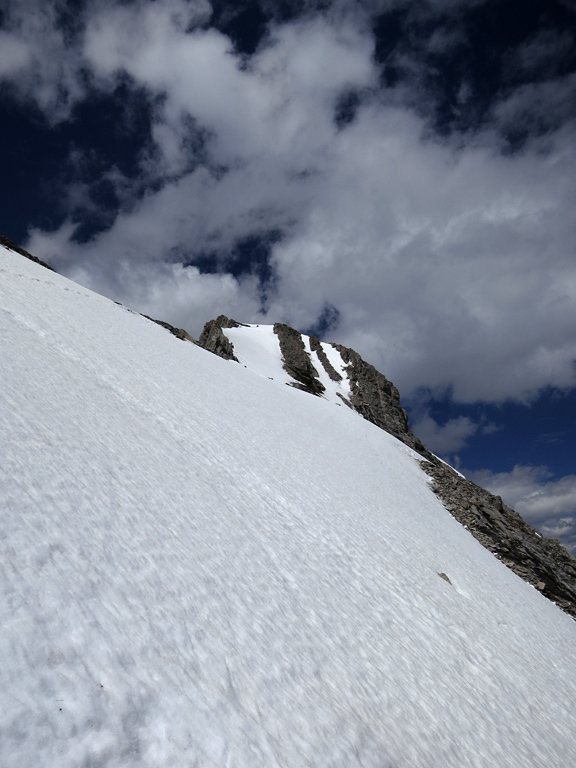 Upon passing the false summit I was confronted by an unexpected snow field. The snow was isothermal, the talus underneath it was very loose and completely saturated with water, and the whole thing was a steeply slanting towards a large, open bowl, a few hundred metres below to the east. A dangerous scenario where the possibility for self-arresting would be slim. I tried detouring beneath the snow to the climber's right, but turned back when that became dangerously exposed on wet rock. I then tried ascending to the top of the slope through the snow and found myself sliding backwards with each step. A third option at this point would have been to return to the false summit and then attempt to walk on the very crest of the mountain (and risk a dramatic fall down the west face), which would have gotten me closer to the summit, but would have still required some risky snow climbing. After a few moments of reflection, I decided against “Plan C”, took one last look towards the summit, and then began the very long (but equally beautiful) descent back to the day use parking area via King Creek Ridge; vowing to come back some day. If you take a good look at King Creek on a topographic map you will probably notice that it serves as a primary drainage for several mountains. If it's been raining to any great extent in the area recently, you can expect the water in the canyon to be thigh deep and fast flowing, and perhaps impassable. As discussed above, Mt. Hood has a snowfield below its summit for most of the year that you simply cannot see until you're within a couple hundred metres of the summit (which also helps protect it from the sun's melting powers). As this area slopes steeply into an eastern bowl (measured at 37° by Andrew Nugara), it can become quite dangerous to traverse when the snow's isothermal and can't firmly support your steps. To manage this hazard, your best bet is to leave Mt. Hood for late summer (July, August, or early September), when it's hopefully snowless, or to treat it as a mountaineering ascent (with an ice axe, crampons and an early start) in the spring. Interestingly, I looked through a few other trip reports for Mt. Hood and none of them mention snow there in July. However, 2012 was exceptional snowpack year for the Rockies and sometimes you just don't get lucky. 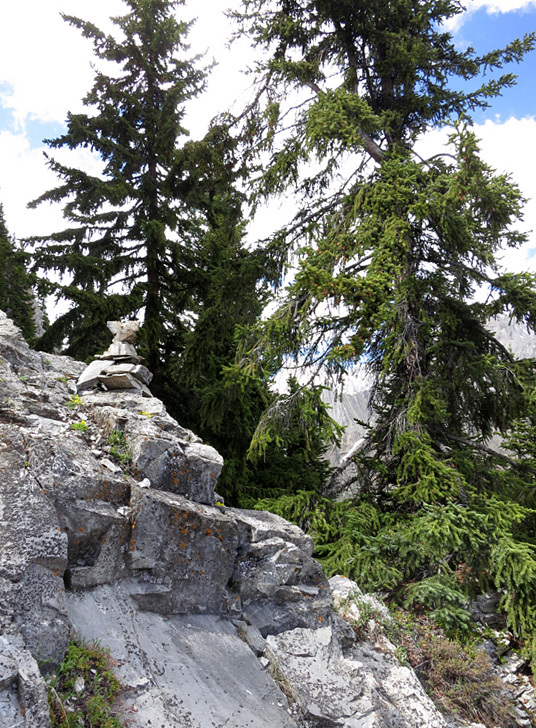 An extended hike covering King Creek and King Creek Ridge is covered in Mike Potter's Ridgewalks in the Canadian Rockies. The ascent of Mt. Hood and a discussion of its history is covered in Alan Kane's Scrambles in the Canadian Rockies. 2,420 m / 7,940 ft.
1,711 m / 5,614 ft.
709 m / 2,326 ft.
200 m / 656 ft.